As I look through some of the photographs from the ’80s and ’90s. I realise what an incredibly busy period it was and how swiftly time moves on. 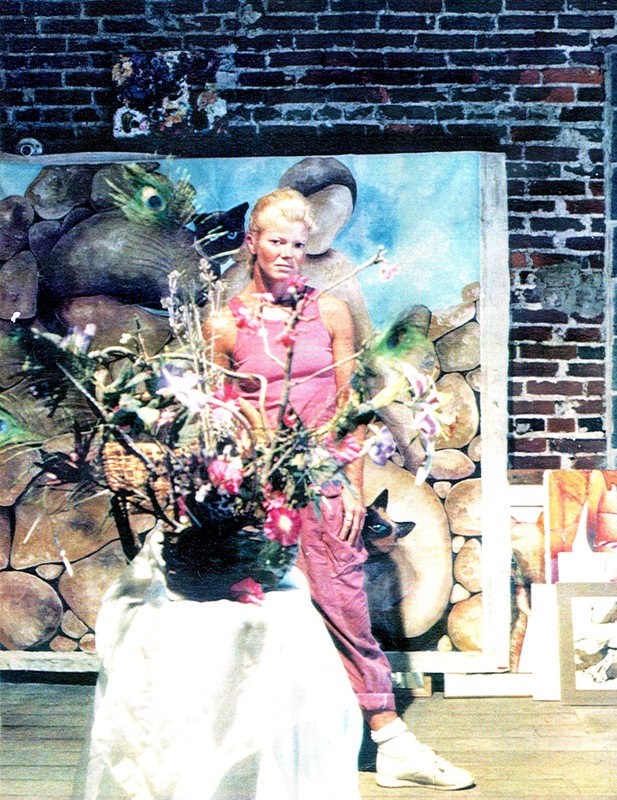 I begin this post with a symbolic self portrait – (large oil on canvas), painted 1989 in my West Chester, Pennsylvania studio. The brick wall behind the chest is the studio. The photograph is of a large self portrait (oil on canvas). The sculpted arm was made by artist Janet Cleveland. The pewter vessel symbolises the female, and the quilt, a subject which featured in many of my biographical still life paintings from that time, symbolises peace and turmoil. Apples feature quite frequently in my paintings. 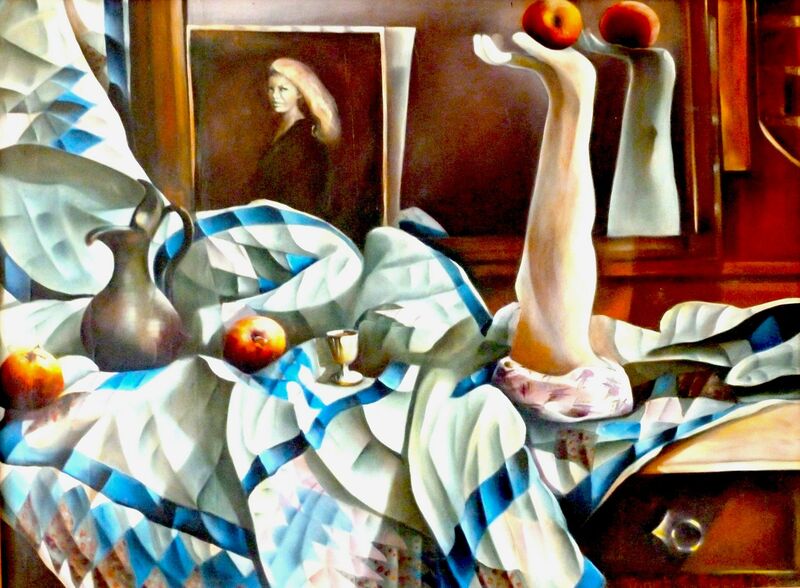 I almost forgot the silver egg cup in the centre of the painting. I was born on the 100th anniversary of the News Chronicle a famous English newspaper of the time. All babies born that day were given silver inscribed egg cups to commemorate the date. It symbolises for me my birth and I have carried it through my life like a talisman. 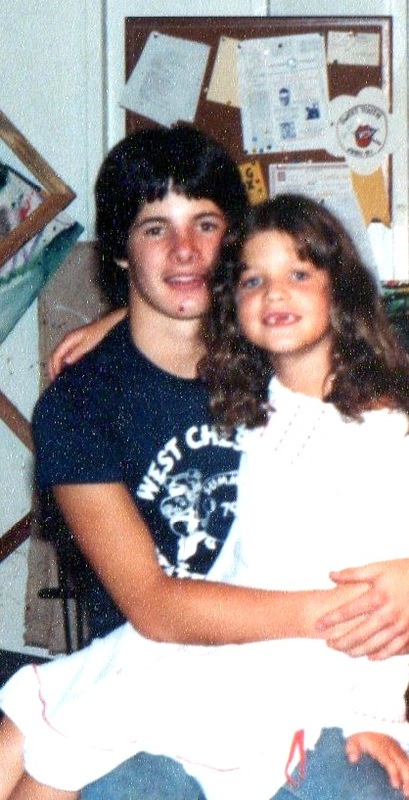 At the beginning of 1980 my son Jarrod was fourteen and Christie was six. 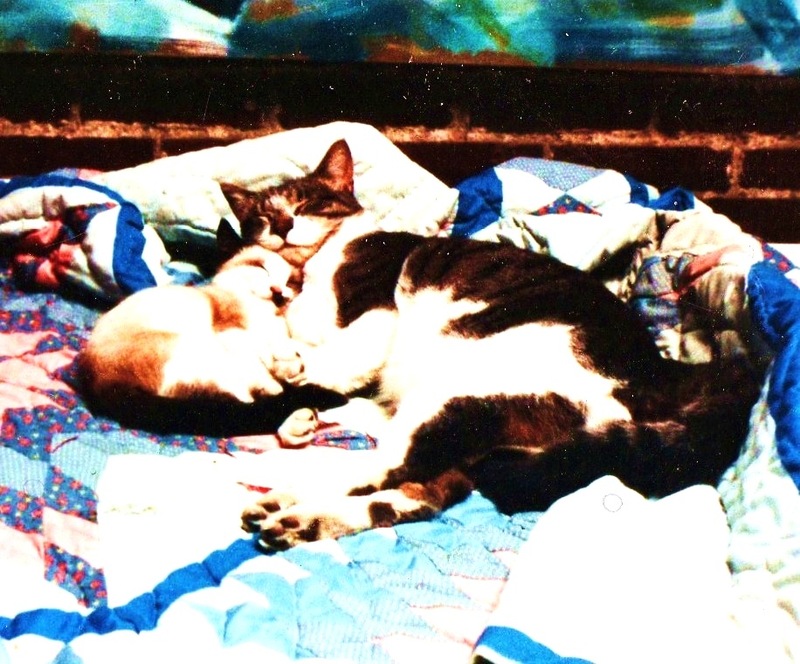 This photograph was taken in the studio behind our house in Westtown. As a family we were busy individually and collectively and that was to continue throughout the ’80s and ’90s. About one year after this photograph was taken we moved three miles into the town of West Chester to a house which sits virtually on the West Chester University campus. Shortly after moving into West Chester, I purchased half of an old carriage house on Prescott Alley which had no heating or running water, just electricity. It had very high ceilings and a great atmosphere and I knew it would be a good studio space. The next photograph was taken after heat and water had been installed. I was able to have several large easels going at one time…which is how I like to work. After my divorce in 1987, I used one half to live in and the other for work, and at the same time managed to get water and heat into the building. I always say that this was the year I grew up! During this period I began to work on corporate mural commissions, for hospitals, banks, hotels, etc. Mural painting was a good way to make money and to keep my tools honed. 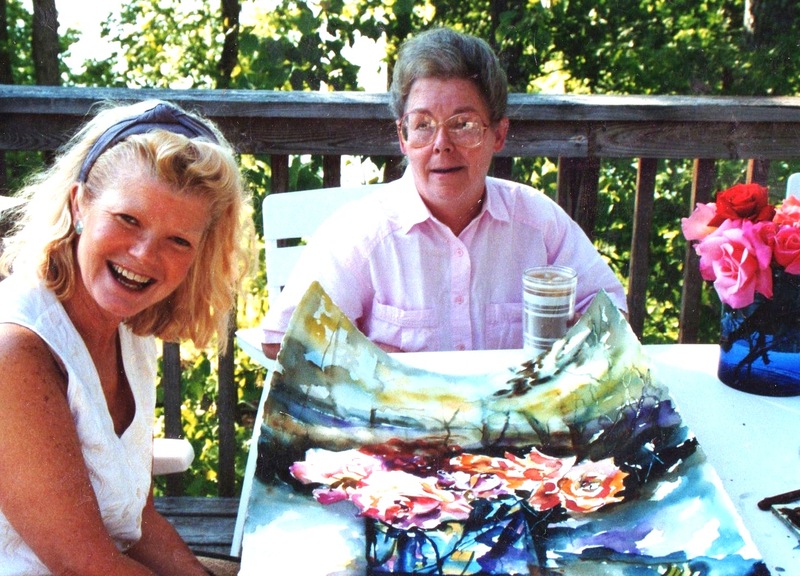 Working with art consultant, Bonnie Paul in the States and others in the UK, the fifteen years when I took mural commissions taught me a great deal. The large painting in the foreground of my studio was inspired by a visit to Isle-au-Maine in the Penobscot Bay, Maine in 1984…where I saw and understood for the first time, the interconnections of life. I saw the human form in the rock formations on the Island and after making many paintings, I returned to my studio where I integrated the human form with the rocks. The large oil paintings I am currently working on continue to be about – interconnections. Around this time, I received a call from my Mother in England who was clearly very upset. My Father, who had walked home from his weekly bridge game, had collapsed with a major heart attack and died. He was only 62, and such a wonderful human being. The death of my Father affected me much more than I realised at the time. He was one of the most kind, gentle people I have ever known – and wonderfully eccentric at times:) I think of him every day. 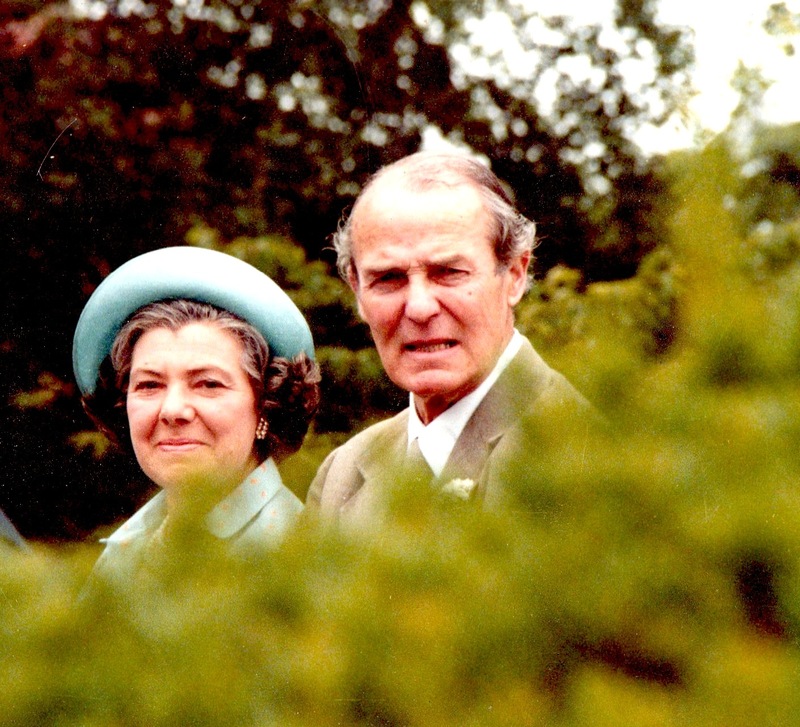 This photograph was taken just two weeks before my Father died when my parents ware at a wedding. I am so grateful to have it. Two images from around 1985. The photograph on the left shows me, my husband and artist friend Mary Ellen Bilisnansky at a costume evening at the Pennsylvania Academy of Fine Arts. The other shows me in the studio with one of the big canvases behind me, inspired by the rock formations on Isle au Haut, Maine. 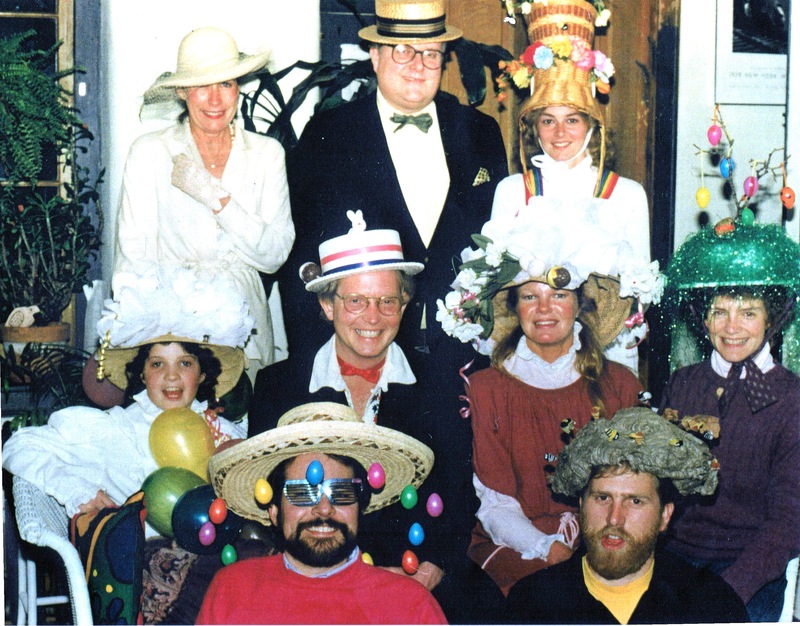 We always had a thing about costumes and dressing up….each year we would get together with this close group of friends to have our Easter hap parade. 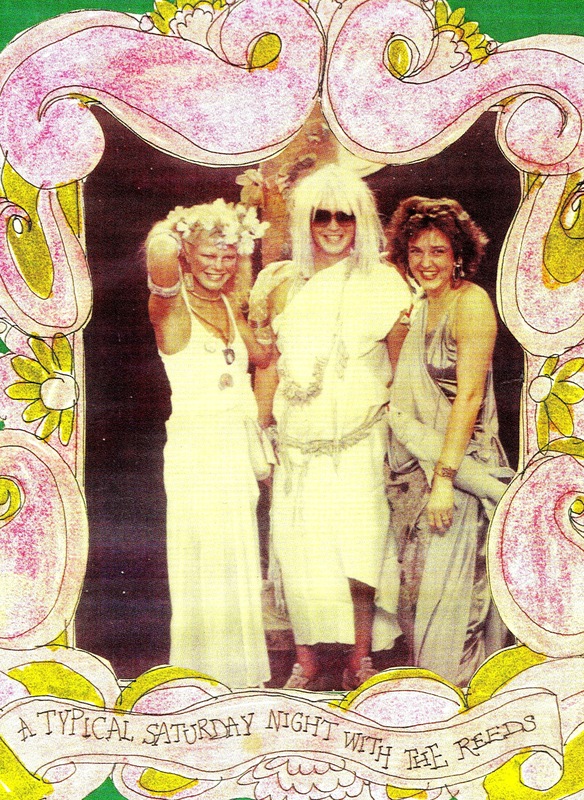 This would have been taken around 1983…Sadly, two of the group have since died…..but my oh my we did have fun. Looking at these photographs is such a reminder of the importance of making the best of every single moment of each day…. I had known since my divorce in 1987 that when Christie entered college, and Jarrod was 27, I would return to the UK/Europe. 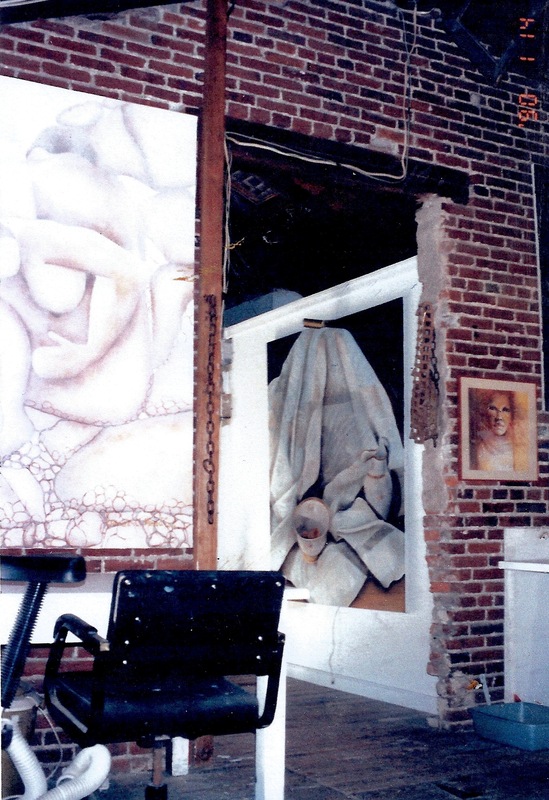 Meanwhile, during the seven years between my divorce and returning home, I completed large mural projects, my own paintings and gave workshops….At one point i was working from three different studios. In 1993, I moved to Crickhowell, a beautiful part of Wales and for the first six months stayed with my cousin Lyn and her family. It was a very special time for me. This picture of me and my two cousins, Lyn and Michael was taken at the heads of the Valley – overlooking the Usk Valley. Crickhowell sits in the Brecon Beacons National Park….a very beautiful part of Wales. For the twelve years that I lived in Crickhowell or as I call it The Magical Town of Crickadoon, life continued to be busy. In 1995, I had solo exhibitions in Cardiff and France….as well as mural commissions at the new Cardiff Bay and St. Edmund’s Church. I continued to commute back and forth to the States where I gave workshops on the east and west coasts, the midwest and in some southern states. During these trips I was able to be with my children and visit friends….and they of course came to visit me in Wales. This photograph taken with my dear friend Jane Lukas, who I referred to as my surrogate Mother….This was taken at her home on a lake in S. Carolina. After giving a one week workshop at the Quinlan Arts Centre, Georgia….I would spend several days with Jane and Jack and be thoroughly spoiled…usually before moving onto the next East Cost stop. For a while there I had an identity issue. When I first moved back to Wales, all the locals referred to me as an American artist, even though I was English! Then when I travelled I was referred to as a Welsh artist…..
After returning to the UK, I met up with my relative, the artist Carel Weight. 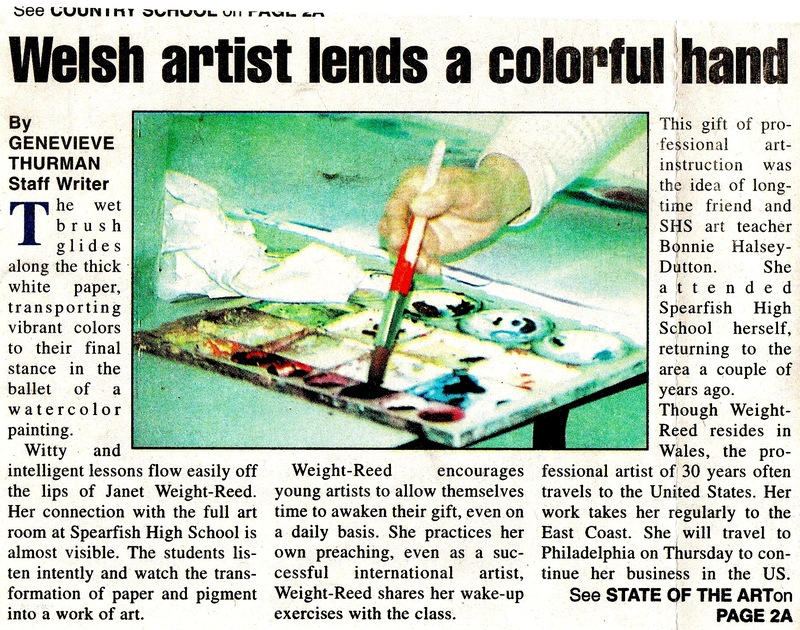 In the States I had painted under the name Janet C, Reed (my married name) and so when I returned I asked Carel about picking up my maiden name Weight again….he thought it was a very good idea, and so that’s what happened. Since then I have used my full name Janet Weight Reed. 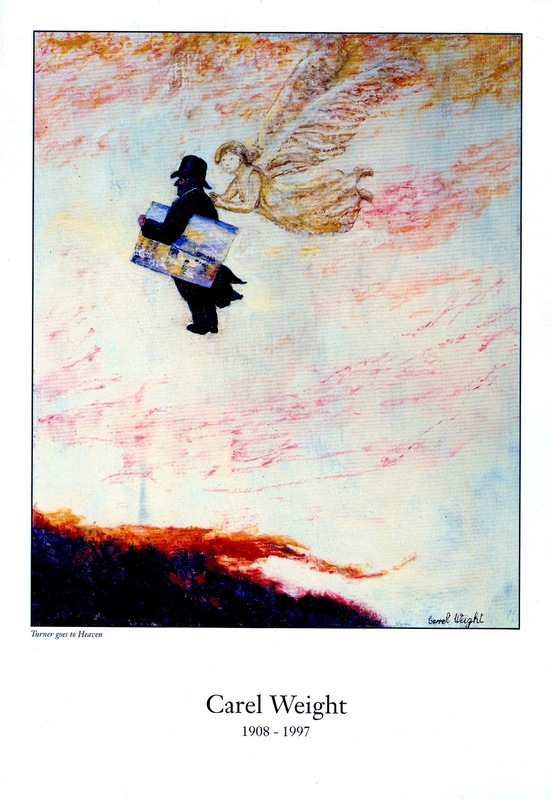 After Carel’s death there was a lovely party to celebrate his life at the Royal Academy and this was the programme – Carel’s painting of Turner drifting up to heaven….. I could show so many more pictures of when people visited me from the States along with photographs of Wales, France, Spain and goodness knows where else, but let it suffice to say that life was full. During the twelve years I lived in Wales I walked every day in and around the beautiful hills surrounding The Magical Town of Crickadoon. 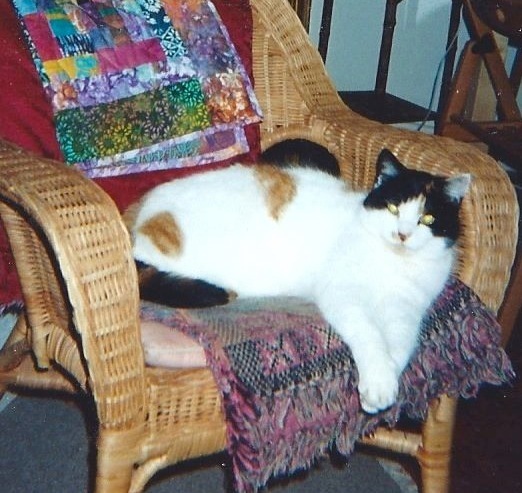 This is my wonderful cat Christeve….It was Christeve who turned up at my cottage door on a stormy Chrismas Eve in 1997 and consequently inspired the book, Christeve the Cat finds her new home…..along with a trans Atlantic project which began in 1999. 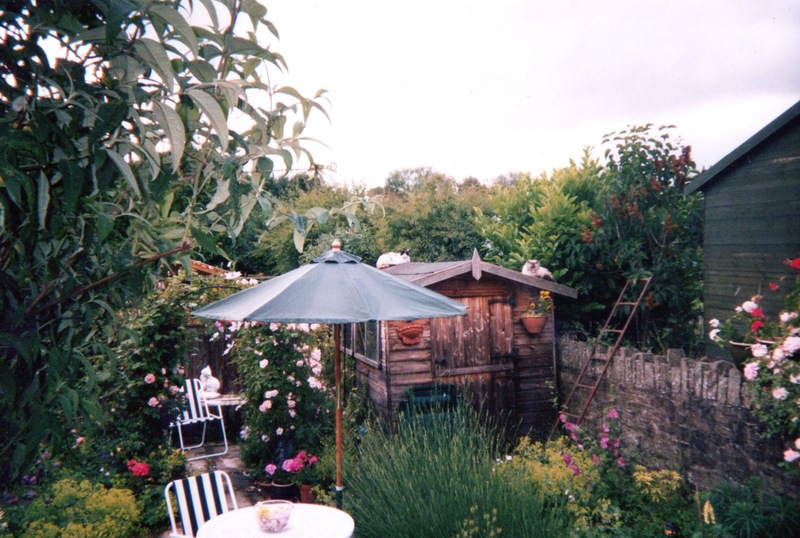 And here is Christeve’s garden….she is sitting on the roof of shed with a friend…. I lived in The Magical Town of Crickadoon from 1993 til 2005 when I moved to London. Next Friday, life from 2005 til now. This entry was posted in Uncategorized and tagged brecon beacons national park, cardiff bay hotel, carrel weight artist, christen the cat finds her new home, HummingbirdHQ.com, isle au haut maine, janettcleveland artist delaware, magical town of crickadoon, pennsylvania academy of fine arts, West Chester Pennsylvania on August 22, 2014 by janetweightreed10.